There I was, smack in the middle of the criminally domeless National Stadium, exposed skin grilled crimson under the pitiless Saturday afternoon sun. Sweat was stinging my eyes, but I couldn't - no, I dared not - move. 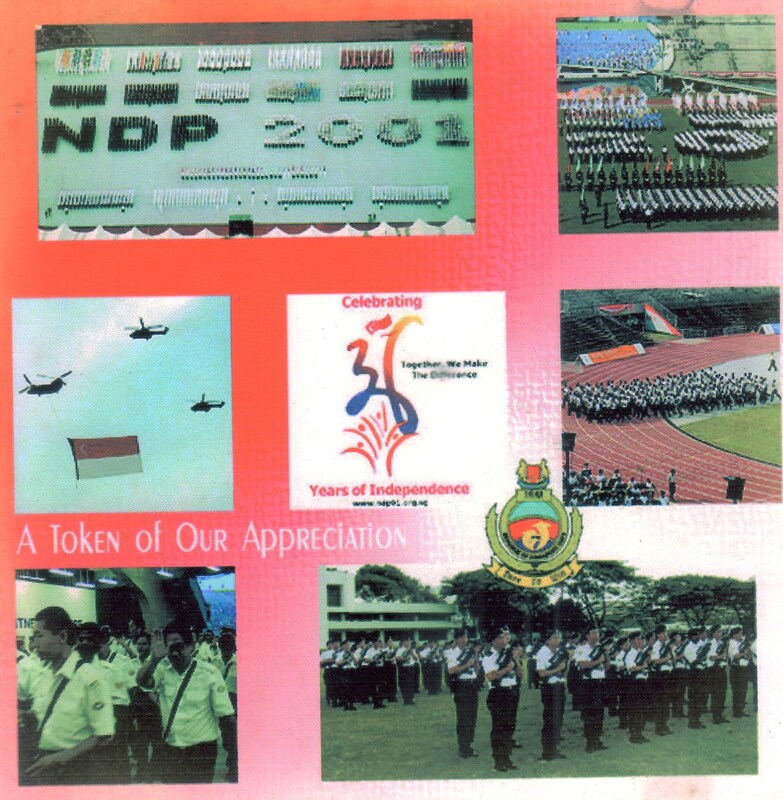 I was part of the navy's marching contingent for the National Day Parade rehearsals, forming the figure 2 in NDP 2001. I wanted to faint. I had never felt so old in my life. Guess I shouldn't have skipped breakfast. And it was my 35th birthday. Such is my love for my country. As a kid watching the NDP on TV all those years ago, I wondered how those soldiers could stand so still in the parade for so long. I would've been contented if I was kept wondering. Perversely enough, when I was called up in March for the NDP, I was actually thrilled by the prospect of - of all things - donning the No 1 ceremonial uniform. I had worn the No 4 camouflage in the army and No 3 shirt-and-slacks in the navy, but never the No 1. I was crushed to learn later that only the Guard of Honour gets to wear the No 1. By all accounts, I'm no Guard, or anything else, of Honour. Back to the ol' No 3 for me. You fantasise about being part of the nation's grandest annual event. But you always thought that when it happened, you would be representing your school or participating during your NS - you know, like when you're young? Not when you're a paunchy, twice-married over-30 NSman, worrying about your job and children's education and paying monthly instalments on your HDB apartment and Nissan Sunny. But somehow, being in the NDP made me feel young and old at the same time. Reunited with long-lost NS acquaintances, I started behaving like when I was in national service, that is, young and stupid, whistling at adolescent pom-pom girls from the pre-parade show until I suddenly realised I am old enough to be their father. And I realised something else: Like it or not, I've been part of the navy longer than I've been part of anything else in my life, be it school, company or marriage. And I'm a better Singaporean for it. The most shocking moment for me was during the first full-run rehearsal at the National Stadium, when they started playing the National Anthem. From where I was standing in the field, I saw grown men in uniform in the gallery instinctively get on their feet and salute in my direction, proudly, resolutely. We, the NSmen in the field, were there because, well, we had to be. But no-one was forcing the audience to salute. I thought it ironic that possibly the truer display of patriotism and genuine love for country was in the stands rather than on the parade ground. But that wasn't the shock. The shock was when I opened my mouth and sang the National Anthem, it actually felt foreign to me. It had been a long time since I had sung Majulah Singapura. Who knew that in the year when I was part of the launch of a TV station, and Ah Girl - the first show I ever created and named after my 20-month-old daughter - went on air, the greatest highlight would actually be my participation in the National Day Parade? I just hope I don't screw it up. And pray it doesn't rain.